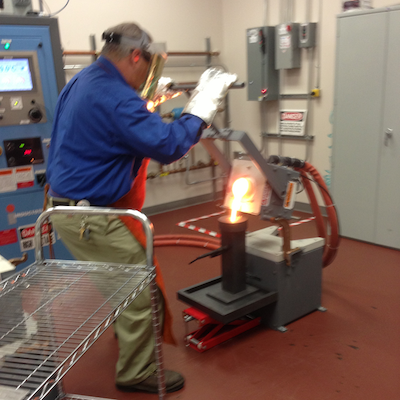 VEM’s induction melting furnace is one of the many ways VEM fabricates precious metal evaporation materials. A vacuum induction melting furnace uses currents of electricity so metal can be melted in a vacuum. Heat is inducted into the material by the currents and the metal is refined and impurities are removed. Its primary function is to melt gold pellets and wire. The gold is then formed by rolling through a series of reduction processes to achieve the required specifications. The end result - high purity, low spitting PVD materials.